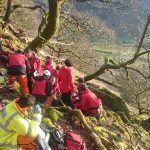 Incident Details: The Team was called to an incident where a 14 year old teenager had been reported as missing after he had run off from his supervisors while camping in the valley. At the same time, shouts for help had been reported in the same area, so the team’s efforts were diverted to that (see Incident 15). The boy was eventually located by the police, walking south along the M6, some 20 miles away! 5 Team members – 1 hour.